I love shoes. Always have, always will. There’s just something about buying new shoes that makes me incredibly, ridiculously happy. There’s a line from the film In Her Shoes with Cameron Diaz and Toni Collette that’s always stuck with me. Toni Collette is explaining why she loves to buy shoes and has a whole closet full, and it’s very simple: shoes always fit. I can’t tell you how many clothes I’ve bought only to gain or lose weight and have them no longer fit me, not to mention all the things I’ve tried on that have looked a mess. So the promise of shoes always fitting and looking good is extremely comforting. Plus, for me, my shoes are often what I love choosing the most when putting together an outfit. They have the power to transform your outfit, to change the style and feel of it. As with most people who love shoes, I constantly have a long list of all the shoes and boots I want. I have to admit that mine is a little out of control at the moment, there are so many gorgeous pairs around. Today’s outfit post, however, is focusing on the newest addition to my shoe collection. These were very high up on my wish list, and ever since I got my floral embroidered bomber jacket they went straight to the top. I kept imagining outfits I wanted to wear my jacket with and in most cases I wanted to have these shoes to finish the look off. 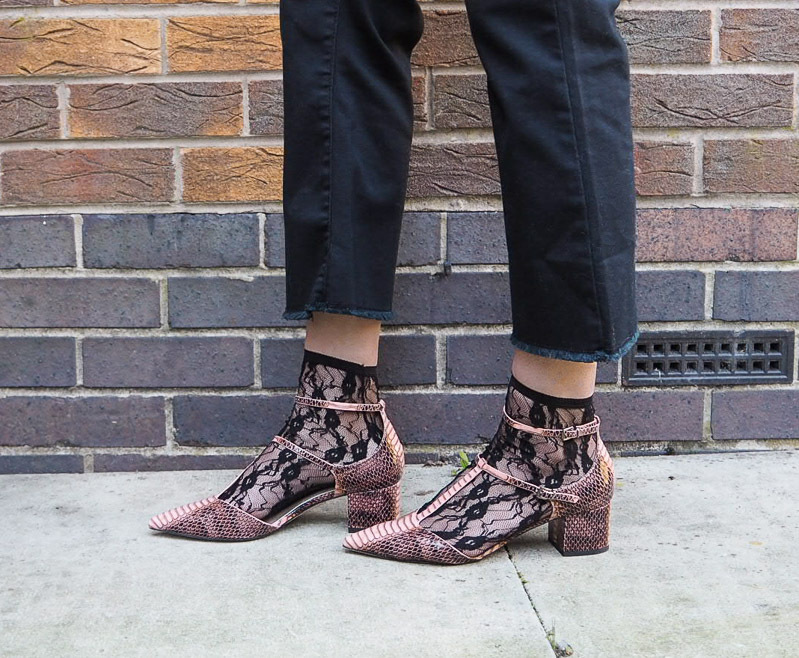 I love a good pair of snakey shoes or boots, but it was the rose and pink colours used on these that made them stand out and pair perfectly with my pink and black jacket. Pink has definitely been very present in my wardrobe choices and fashion purchases as of late, so the shoes were a perfect fit. There’s so much I love about them that made them special. First up, they’re T-bar shoes, which is one of my favourite styles. They have a pointed toe, which I tend to go for as I like the kind of ladylike effect it gives. And finally, they have a low heel that makes them comfy and wearable for every day. So they’re ticking all the boxes for me. As I said, I wanted these shoes primarily to go with my bomber jacket, so of course I had to wear it with the shoes the first time they went for an outing. I’m also wearing my new kick flares which I showed you last week, and a white, longline top in a sheer, printed knit that has blouson sleeves and lots of frills from Stitch & Pieces. I think the shoes pair really well with the outfit. 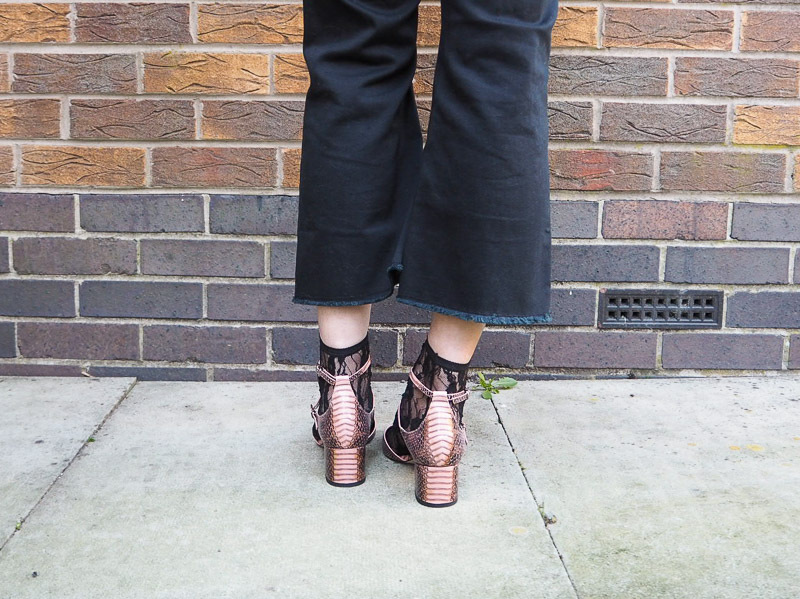 They’re pretty shoes that are quite slim and dainty, and I like the contrast between them and the rest of my outfit which is very oversized, loose and casual. Well Katie..... Another fabulous post which I really enjoyed reading. And I'm loving your outfit too, it's lovely to see you in a more casual looking outfit. Your style is so versitile and you look so fantastic in anything you wear! Gorgeous shoes, gorgeous outfit, gorgeous girl. Those Snakey Shoes look phenomenal!!! Love your look! I'm a massive shoe lover. I could buy shoes every day. I adore those snakey shoes, Katie. They are gorgeous. 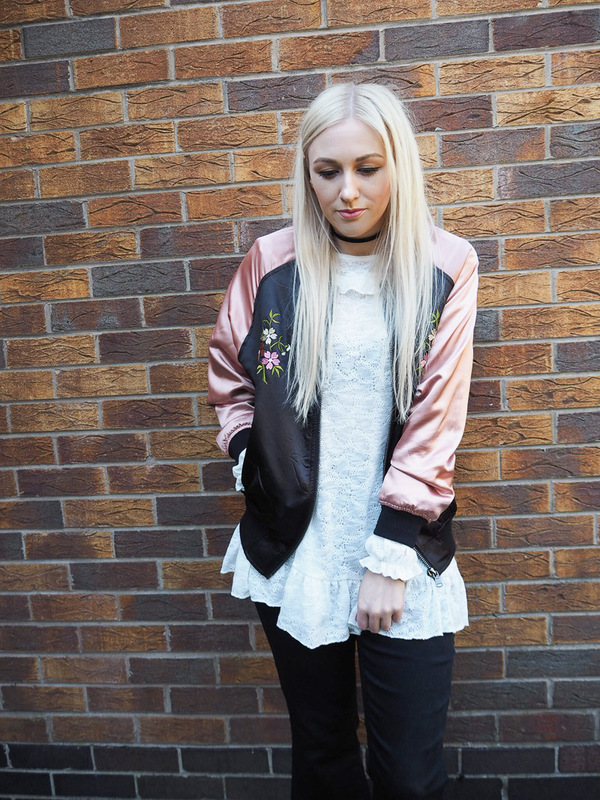 I'm OBSESSED with how you combined this entire outfit! You look incredible from head to toe, honestly such a good look on you. 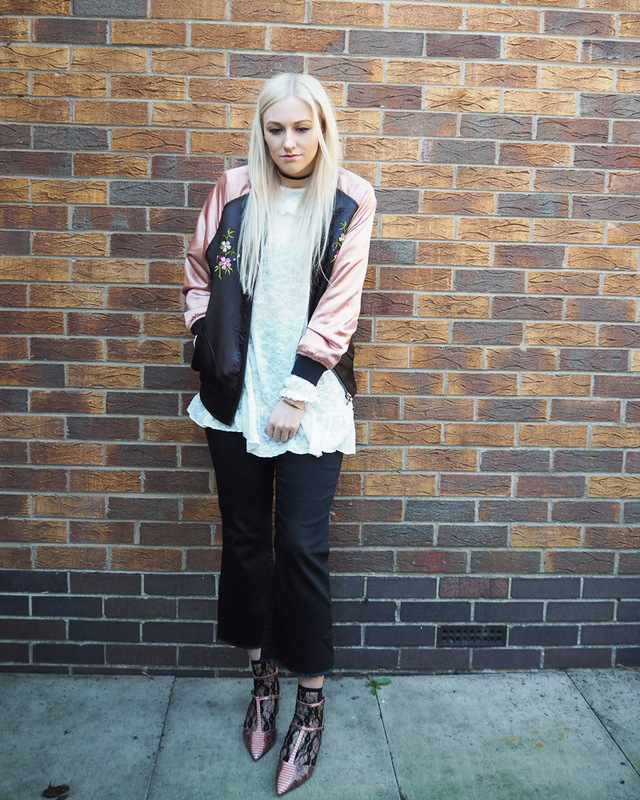 Just favourited the shoes & the socks on ASOS, you most definitely gave me some great style inspiration with this outfit Katie! These are fab Katie! 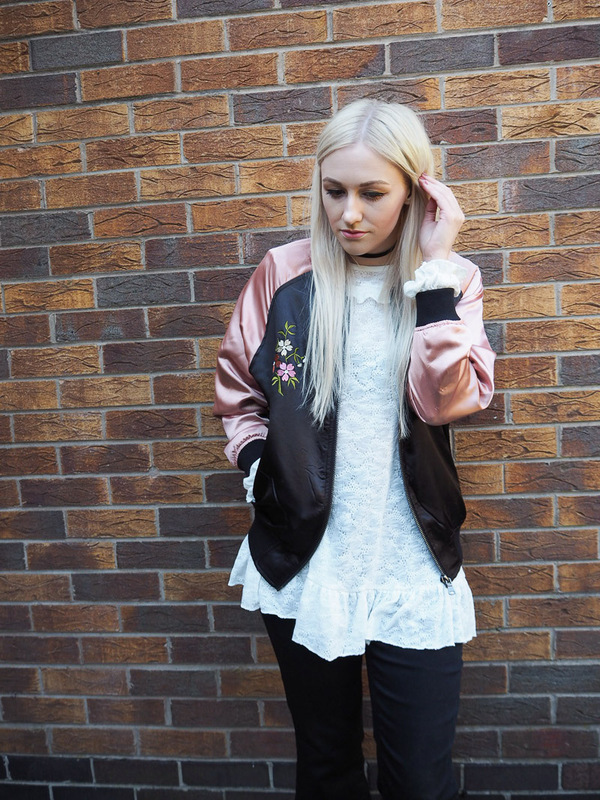 And I love how they match your bomber :P great styling! I also love shoes and your pair looks very special! Pretty look! I love it! the jacket, the shoes. We both are ASOS fans! Oh my goshhhh.. i just love everything you put on your blog! Such great style! I never saw that movie! I certainly have to watch it! Your shoes are adorable and I love it how you styled it with those laced sock! A wonderful, chic outfit! Really adore this outfit! 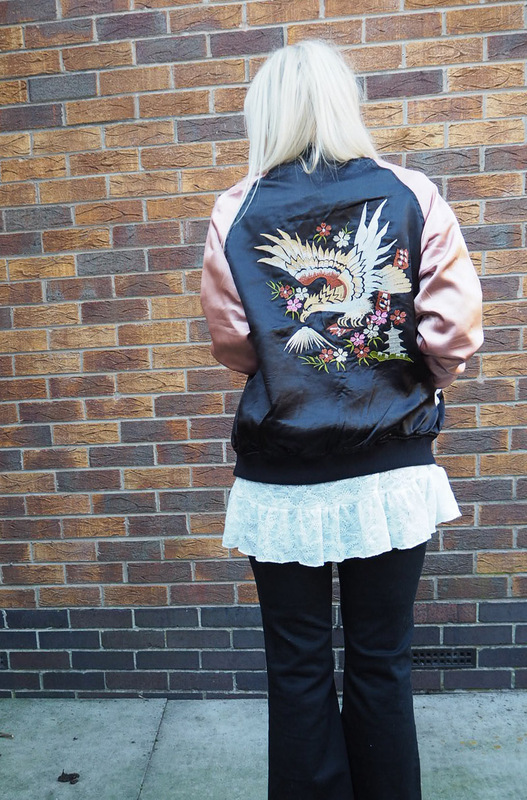 You may have tempted me to venture out of my monochrome comfort zone with that embroidered bomber - looks so effortlessly cool.